The WatchESPN app is free to download for FusionTV subscribers from the App Store, Google Play Store, Roku Channel Store, or WatchESPN.com. Simply select Alpine Communications when prompted and enter your TV subscription username and password. Register for TV Everywhere and watch a variety of TV series, sports, news, and events – live and on demand – for no additional charge. Before gaining access, you must register at www.WatchTVEverywhere.com, so have your Alpine Communications account number handy. 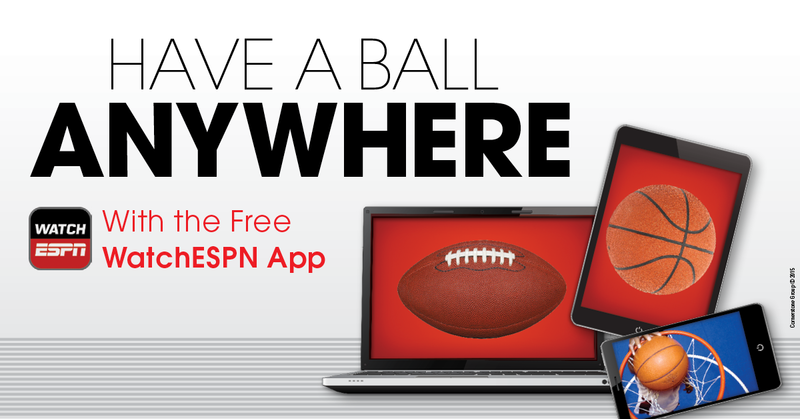 Call 563-245-4000 today to get in the game with WatchESPN. *FusionTV subscription required. Live programming not available with all networks. Mobile data rates may apply when accessing a wireless network. WatchTVEverywhere is included with a qualifying FusionTV plan.